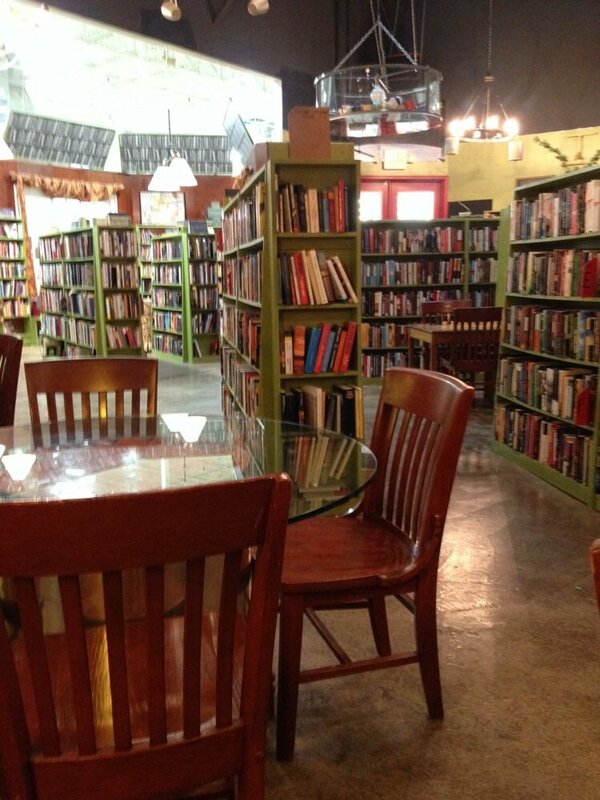 Inside view of Cafee with bookshelves, moveable tables and chairs. Nothing like networking, catching up and getting to know new people around some good food. Such was the recent Coffee and Conversations meeting of WEAN Charlotte - Women Embracing Abilities Now at Julia's Cafe and Books on N. Wendover Road. I haven't laid eyes on some of these women in over a year, so it was at first a bunch of hugs and trying to catch up beyond Facebook posts and messages. 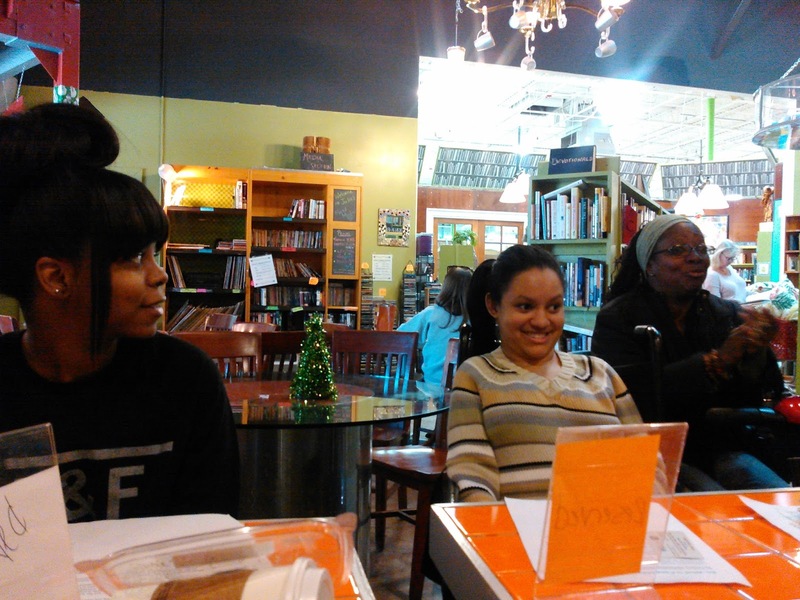 If you are not familiar with WEAN, it is a group started in Maryland by Janice Jackson as a peer counseling/support group for women of varying degrees of disabilities. The goal is to not make the disabilities the focus of life, but to focus on the abilities that we all have. Monique Stamps started a sister chapter here in Charlotte several years ago, and through sheer tenacity and the power of her personality, she has mentored and motivated a group of women to share their lives, their struggles and their triumphs with each other. I am happy to be a member of WEAN Charlotte and support their efforts. Monique is also a certified Zumba instructor, who regularly holds classes and Zumbathons here in Charlotte. 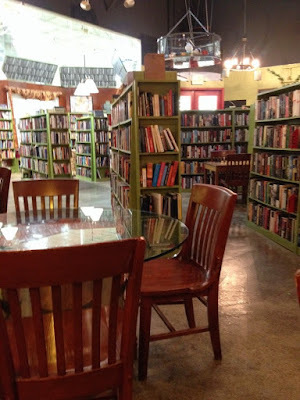 Julia's Cafe and Books is located on N. Wendover Road as a coffee house slash bookstore, where the proceeds of purchases support Habitat for Humanity of Charlotte. So, it is a win-win place for great food and contributing to the community. From their own kitchen and other fantastic local food vendors, such as Magnolia Coffee Company, Friendship Trays, Brüks Bars,Nova's Bakery, Secret Chocolatier, and Anderson's Catering, they provide a wide variety of food items, coffees and sweets. I had a Spinach Pie, which was pre-packaged, but easily reheated with the microwave provided in the bookstore. It was really good and a perfect health-conscious choice. Don't forget to go over to the Resource Store next door and peruse the gently used items for sale. There are wonderful bargains and finds not found anywhere else in the city. The items are replenished on a regular basis so check back often. And, enjoy a Chai Latte from Julia's! Some of the lovely ladies of WEAN- each and every one a success story! 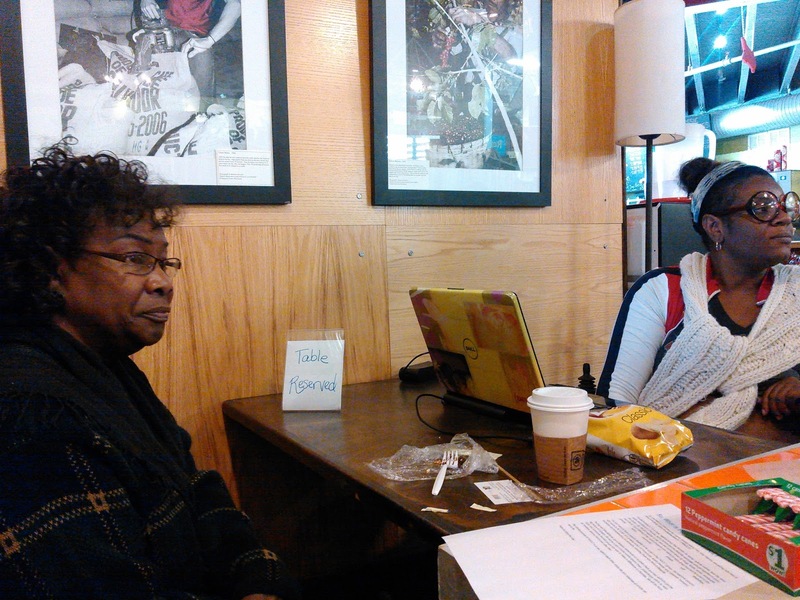 Every Saturday at 10am, a volunteer reads to children of all ages! On this one, accessibility is fantastic. I do recommend CA (Call Ahead) if you have several people who will use mobility devices. We had four women at our meeting and we did need to move tables out of the way. This was not a problem, but we did feel a little cramped. Flat concrete sidewalk with ramp with low threshold at entrance. No automatic door, so someone will have to hold the door for anyone using a mobility device who needs assistance opening doors. No online menu as their items change throughout the year. See food vendors listed with links above to get an idea of what can be offered. Again, CA if you want to be sure what is on the menu the day you want to go. Establishment is moderately well-lit with smooth flooring. It is usually quiet, as people are reading or working here. There are children, and adults of all ages. Night-time, it is well lit with a very inviting feel! Staff is VERY accommodating; friendly and supportive. Have never come here and had a bad customer service experience. Parking is free and plentiful, though it can fill up with Resource Store shoppers.